I'm so excited to be able to share with you the news that the Good Night Captain Mama book is now officially a series! You may remember my review a couple of years ago of this ground-breaking book that highlights a Latina in the military. Now, author Graciela Tiscareño-Sato has created a sequel. 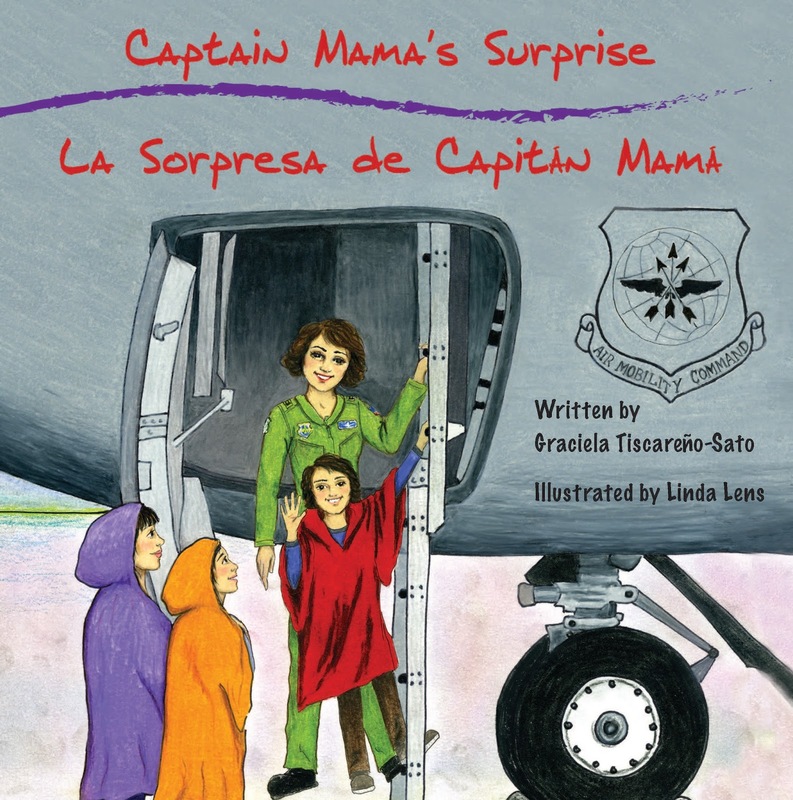 "Captain Mama's Surprise ~ La sorpresa de Capitán Mamá" takes young readers into the depths of a KC-135 Aerial Refueling Tanker. But this time, the story is told by 7-year-old Marco. I don't believe there are any other children's books that feature minorities - specifically Latinas - in military service, which makes this series so valuable. I love how the author not only describes the duties of the individual officers, but she also includes an activity at the back of the book to extend the learning after the reading is done. In this case, there is an art project involving the KC-135. And yes, it comes with full text in English AND Spanish! The illustrations by Linda Lens, are simply fabulous and help the reader to experience the same things that young Marco and his 2nd grade class do in the book. The details of the airplane especially help to make the story come alive for the reader. As we saw with the first book, "Captain Mama's Surprise" also comes with an embroidered patch for your child to add to his or her collection. The book is now available for Pre-order with an expected publication date of July 4th. Books ordered direct from the publisher will be received within 10 days of ordering ahead of pub date. Teachers! The publisher is also offering a special educator's package that includes 31 books & patches for your students. You can Pre-order directly from the publisher website. This book is a wonderful tribute to the Latinas who have and currently serve our country. Thank you Monica. We're JUST getting started. There's so much world to show our kids and so much airplanes can teach them. Flying airplanes is one way to see the world, as I was blessed to do while serving in the USAF! I appreciate your support very much and look forward to further serving your community once the book is published!